Connor Frye is a graduate chemistry student at the University of Minnesota-Twin Cities. Graduated from the University of Tennessee at Chattanooga. 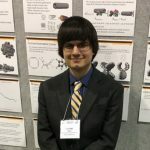 At UTC, he had the opportunity to work on two separate research projects in conjunction with five semesters of coursework, and participate in two full-time summer research programs. His research projects were in computational and organometallic chemistry.